H.M.S. Dreadnought was the first all big gun battleship to be built. She was laid down at Portsmouth Dockyard in 1906 and was commissioned into the Royal Navy one year later, a building record that has never been equaled. In addition to her uniform main armament of ten 12 inch guns, another major innovation in her design was the use of steam turbines for propulsion, giving her a five knot speed advantage over contemporary battleships. 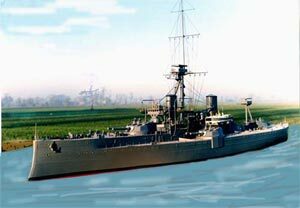 Her uniform main armament meant she was the first ship which could actually take advantage of the great effective range of large naval guns. By firing her guns in groups, aimed from a central control, it was possible to correct the guns' aim by spotting the fall of the shells and correcting the aim accordingly. The hull is a one piece fiberglass moulding up to the deck line and including the raised focastle to ease construction. All plating and surface detail is moulded into the hull. The deck is 4mm marine plywood with the main deck and foredeck C.N.C. CUT. The deck planking is printed on .6mm marine plywood ready to lay, plus instrctions for laying individual planks for the modeller wishing to add his own touch. The main turrets are also fiberglass mouldings. The 12 inch gun barrels are Acrylic castings. Ships boats, funnells, D.C. towers etc are all vacformings, with optional extras available for precast ships boats as acrylic cast items. Almost all other fittings requiring detail and strength, such as the 12 pounder guns, hatches etc, are cast in light alloy.